10x Genomics said today it has acquired Spatial Transcriptomics for an undisclosed price, in a deal that maintains the buyer’s expansion mode. Based in Stockholm, Spatial Transcriptomics offers technology designed to allow RNA sequencing to perform in 2D—technology that the company says has since been adopted by customers that include several pharmaceutical companies, as well as leading universities. Spatial Transcriptomics is a provider of spatial genomics technology originally developed at Science for Life Laboratory as a joint project between two of Sweden's leading universities, Karolinska Institutet and the Royal Institute of Technology (KTH). “The initial thought of the Spatial Transcriptomics technique was born out of a frustration that many types of analyses we do require taking a cell out of its context,” company Chairman and co-founder Jonas Frisén recalled, in a statement published on the company’s website. “One day, I was pondering whether it would be possible to tag cells in their natural environment, to enable analysis of cells and their niches, rather than taking them out of their context. Spatial Transcriptomics uses spotted arrays of specialized mRNA-capturing probes on the surface of glass slides. Each spot contains approximately 200 million capture probes with a spatial barcode unique to that spot. The barcode is incorporated into the cDNA of all mRNAs captured by the spot—in order to link all subsequent RNA-seq data back to a spot on the array, and a location in the tissue section. When tissue is attached to the slide, according to Spatial Transcriptomics, the capture probes bind RNA from the adjacent point in the tissue. A reverse transcription reaction, while the tissue is still in place, generates a cDNA library that incorporates the spatial barcodes and preserves spatial information. Following library preparation, the captured mRNA is sequenced using standard Illumina sequencing. Spatial Transcriptomics has developed foundational IP and says it is the first to capture the transcriptome, all active genes, from tissue section. The Spatial Transcriptomics workflow is designed to bridge microscopy and RNA sequencing to generate complete transcriptome data from a single intact tissue sample, and uses standard instrumentation for sequencing already present in most labs, allowing for barrier-free adoption. “Spatial genomic sequencing is the next frontier,” Spatial Transcriptomics co-founder Joakim Lundeberg declared. Lundberg, Frisén, and the company’s other co-founder, board member Patrik Ståhl, will remain a part of the combined company and continue to collaborate with the 10x Genomics team, the acquirer said. 10x Genomics added that it will continue to operate Spatial Transcriptomics out of its existing offices in Stockholm, and grow its presence in the heart of Sweden's scientific community. 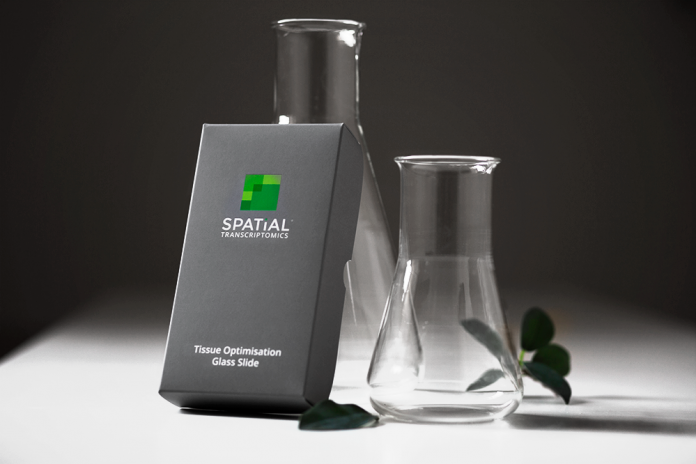 The purchase of Spatial Transcriptomics is 10x’s latest expansion move. In recent months, 10x Genomics acquired the epigenetics company Epinomics for an undisclosed price; disclosed plans to quadruple its presence in Pleasanton, CA, by growing its headquarters and manufacturing; and introduced new products. One new product showcased in October at the 2018 American Society for Human Genetics Annual Meeting (ASHG 2018) was ChromiumTM Single Cell ATAC Solution, which according to 10x Genomics came out of Epinomics and is the first commercially-available solution for rapid and massively parallel profiling of single cell epigenomic signatures. Last month, 10x Genomics told the San Francisco Business Times it planned to move its operations from a 40,000-square-foot facility to a 150,000-square-foot space next year, and create approximately 200 new jobs in coming months. 10x Genomics received a combined $125 million in new funding in April, consisting of a $50 million Series D financing and a $75 million debt financing. “10x Genomics is on a quest to unlock a complete understanding of biology, and our recent growth and acquisition activities are accelerating our progress exponentially,” Saxonov added.